Sunny Apartment in der Altstadt! Die Wohnung befindet sich im vierten Stock eines traditionellen Gebäudes aus den 1880er Jahren ohne Aufzug und liegt nach Süden auf einem kleinen Platz mit mehreren Bäumen. Es hat allen Komfort: Der Hauptraum ist ein atemberaubender Wohn- / Essbereich, er ist exquisit mit antiken Möbeln und Dekor eingerichtet, ein großes und ein kleines Schlafzimmer, ein komfortables Badezimmer mit Badewanne / Dusche, eine voll ausgestattete Küche, acht fenster, die mit drei balkonen viel licht spenden. Im Wohn- / Essbereich und in den Schlafzimmern gibt es Parkettböden. Sat-TV und Video, Waschmaschine und gepanzerte Haustür. Haustiere sind nicht erlaubt. We arrived quite late on a Saturday evening but Nathalie and Yan were very accommodating, despite their impending 3 hr journey into the mountains. The apartment is located in the north of the old town just a 10 min walk to the beach but right among the best restaurants Nice Vieux has to offer. There is a large MonoPrix Supermarket 5 mins away and is a similar distance from the nearest tram stop. The apartment itself is exceptionally spacious and accommodating. 3 fabulous balconies overlooking 2 aspects with bustling restaurants beneath. It was a real pleasure to have a drink or meal on the balcony watching the ebb and flow of diners and tourists explore the area. One point to mention is the 80 steps up to the front door (no lift, due to the property's 1880s manufacture) so would be more suited to the young or fit tourist but a couple of trips up and down per day would be a welcome 10 minutes' fat-burning exercise to most people's holiday regime. Nathalie and Yan are excellent hosts and will explain all the apartment's functions and utilities on arrival. We didn't have any special requests or requirements but found that it was very well appointed with a dishwasher, washing machine, iron, hairdryer, kitchen utensils, towels and most importantly fans (during August!). 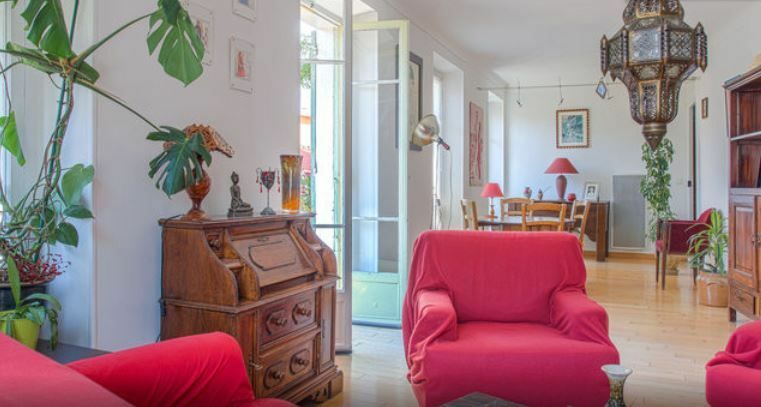 Staying in this apartment in Vieux Nice is wonderfully serene. We sat out on one of the three balconies watching all the trees come into flower and bloom. The apartment is lovingly furnished and decorated, quiet, within walking distance of the Saleya and its markets – food and antiques were our favorites. You can walk anywhere – art galleries, museums, wonderful restaurants, the Port, and a 7 minute walk across the Promenade du Paillon lies the Nice of high-end shopping, casinos, the sea -- the whole Cote d’Azur experience. The bed was comfortable, the apartment was spotless and the owners were lovely. Staying there was a highlight of our trip. Thanks Barbara and Jon. I am really happy that you have a pleasant trip in my apartment. I hope you will be back again and have nice times in the old town of Nice !! This was the perfect place for our stay in Nice. The owners were wonderful and flexible; we'd had some trouble at the airport and were hours late in arriving at the apartment and meeting them. They were very gracious about it. The apartment is beautiful--full of light, clean, and decorated with great art. It felt very much like a home away from home. The balcony was wonderful with nice views, and my husband and I had pastries and coffee there nearly every morning. The location was perfect for us, with the many restaurants and the rambling streets of Old Nice right below. We were travelling with our two children, and an unexpected surprise was a beautiful, large playground a very short walk from the apartment. Green, centrally located, with fountains and beautiful natural wood playground equipment and plenty of benches; the playground was packed with locals and proved a very nice place for my husband and I to relax while the kids happily burned off energy. I'd definitely recommend this charming apartment, and we hope to stay there again. Thank you so much Cassie for this wonderful review. We hope to have your lovely family back soon !! All the best. A Really Beautiful & Charming Apartment in Old Town, Nice. The owners are wonderful and gracious people, They greeted us, showed us the apartment, all it's ammenities and then were off to their mountain home. It's a georgeous apartment! Has everything you need for an incredible stay. The location on the perimeter of old town is perfect. As stated it has several balcony's and so much light. The breezes keep you cool in summer. It's sits four floors up above a square which entertains and keeps you company but is not too loud. The apartment is so well maintained. The furniture and the art all work together. It was so comfortable. The nearby resturaunts are some of the best. The fresh produce and meat market a stones throw. You will love your stay but please leave me some room on the calendar, we will return one day soon! I stayed here with a friend of mine for 8 days. The apartment was very comfortable, and the owners are lovely people. There are 2 bedrooms with a split floor plan and one large bathroom. The apartment is a very short walk to the beach, great shopping, and some delicious italian restaurants. The only complaint we had about staying here was the noise and the lack of air conditioning, but the pros definitely out-weighed the cons. I would stay here again and 100% recommend it to anyone looking for a nice place for 2, max 3 people to stay. This is a lovely, spacious apartment in old Nice. There are shops, bakeries, restaurants and grocery stores all within easy walking distance. The tram is also close by. The apartment was very clean and we enjoyed sitting on the balcony to take in all the atmosphere and activity of the old city. If I should have the chance to return to Nice, I would stay in this apartment, not a hotel.